This product is a radical design change in the portfolio of aids developed to help the golfers improve their game. It works on the basic principles swing plane and managing the body movements for getting that perfect sing and strike. The Explanar aids the learning of the swing by being the mentor or a guide throughout the process of the swing, all the three stages. It is similar to guides in machine which help the exat flow of direction of parts of the machine. The Explanar has two parts that work in tandem i.e. the hoop and the weighted Power Roller. The process that a player has to follow is ;after stepping inside the Explanar rest the Power Roller on the hoop and take his grip and position himself for taking the swing in the centre of the Explanar ensuring that the position of the Power Roller is in the centre. The suitable adjustments are made to the Explanar so as all the aspects of the body movement in terms of speed, body positioning, stance and angle are taken into consideration for its optimization. It’s a tough task to take the same quality shots that one has been taking during practice to be replicated during a match. So the situation difference can make it difficult for you to decide on the parameters to be considered for making the swing, to help you in such situations the accompanying DVD would clear your doubts about planning the swing you need to take. The weight of the Power Roller plays a critical part in training and retraining the swing and eradicating ingrained faults in established players. Practice on the range doesn’t guarantee a repeatable swing. Regular use of Explanar rapidly transforms a motion resulting in a more repetitive and therefore consistent swing. This builds confidence and helps lower scores. See Explanar testimonials. Practice makes a man perfect and work out keeps him fit. When you do the needful practice with this training aid, your body will get toned to the level that is a must for playing a good golf game. Body organs and the muscles would get into shape for it. The fitness that your arms would get help you take the right swing and the stance practice would help you become consistent an firm on the field while playing.All this would also add to our personality as a person in society. If you have any questions regarding the Explanar Golf Training System, please give us a call, we would be happy to help you with any questions you may have. 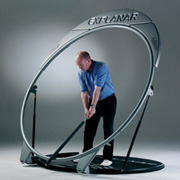 Write an online review on the Explanar Golf Training System, and share your thoughts with others.